Hi, I’m Jesse Anderson the author of this book and Managing Director of Big Data Institute. I’m former Cloudera and Intuit too. I’m published on O’Reilly and Pragmatic Programmers. I’ve been covered in everything from The Wall Street Journal to the BBC to NPR. I speak extensively at the top Big Data conferences like Strata+Hadoop World. I’ve taught extensively at hundreds of organizations and had thousands of students in my classes. I teach both the organizations’ management teams and their technical teams. With all of this experience, I can walk into a company and know within a short time whether the organization will fall into the 85% of failures or the 15% of successful projects. If you want to know how to steer the Big Data road ahead, ask someone who’s been there. Jesse’s been there and can help get you there, too. Would you like to know what I teach successful organizations to do? Would you like to avoid the failures of unsuccessful organizations I’ve fixed? I wrote the book on managing Big Data projects. In it, I pass on the concepts and topics I teach at Fortune 100 companies to make them successful. These are the strategies, concepts, and tactics that take underperforming or failing teams and makes them productive. I show teams that are just starting out how to set themselves up for success. I’ve captured this extensive knowledge and experience in my book, Data Engineering Teams: Creating Successful Big Data Teams and Products. 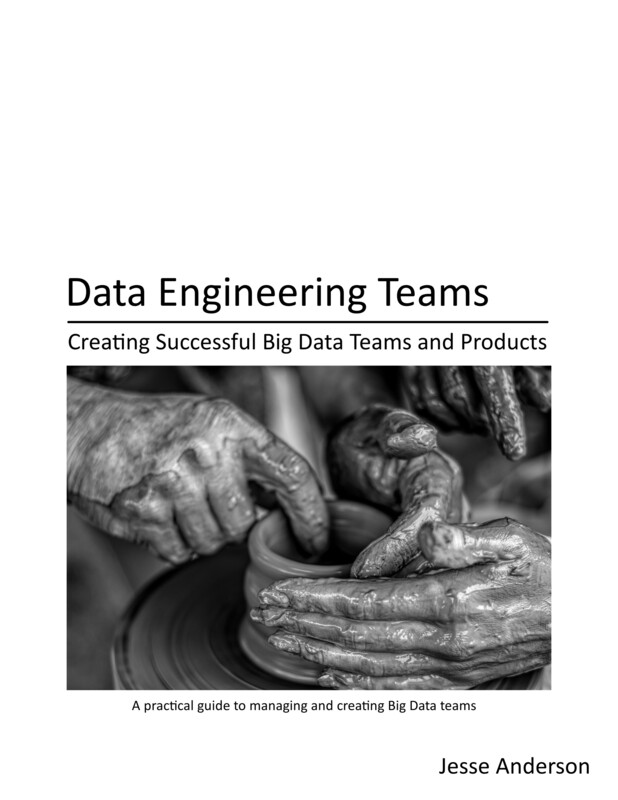 This book represents the practical guide for how to manage and create Big Data teams. It shows the exact steps I teach organizations to take when creating Big Data solutions. The book is available in PDF and EPUB formats. Once you sign up in the form below, we’ll send you the links so you can download it and read it. We’ll also give you the extra tools to help you calculate your probability of success. We’ve always had teams for managing databases, but with the data management landscape so rapidly evolving – you need to take your data teams to a whole new level. Jesse Anderson is an industry veteran who taught and mentored countless data engineering teams – it is wonderful that he finally decided to put his vast knowledge and experience on paper. Whether you are trying to modernize existing data infrastructure or you are building a brand new team from scratch, this short book has everything you need to get started in the right direction. I’m impressed by the content. I was a bit skeptical when I saw the title, but the content is really great. This topic can be boring and depends a lot of the organization. Jesse’s approach is interesting because it’s based on fact and technical skills oriented, which makes more sense to me. Data Engineering is a topic rich with complexities; Data Engineering Teams distills that detail into manageable pieces. Coming to lead a data science and engineering team from a data science background, it was incredibly helpful to have the data engineering team’s capabilities spelled out in practical detail including how their skillset complements those of data scientists. It has never been more important to attack software development with an iterative process and a learning oriented mindset.Data Engineering Teams is an invaluable guide whether you are building your first data engineering team or trying to continually improve an established team. Since reading this book, our team members understand each other better and we have already seen improvements in collaboration between data scientists and engineers. Personally, I am working with Hadoop for ten years now and it still surprises me at what entry level the technology is at enterprise. Even with just MapReduce, before the dawn of real-time and event processing in Hadoop, the promises were tremendous – yet still many struggle every day to find their application of Big Data. We all know it is a must and that there are great opportunities out there, we read it very day. But why is it so hard to find them, and even harder to get implemented successfully? Jesse has years of experience in the field and knows the issues first hand. I have to commend him for saying it straight up: there is a skills gap that needs to be filled by more than one person. You have to assemble a team that brings together everything that (at least to a basic level) is needed to succeed in implementing Big Data solutions. Please heed his words, they are only too true to be missed! I wish every middle to upper management would read this first. Take the first step towards a successful Big Data project and download our free E-Book.